The value of pipe #091 is n/a points. Mick Ratliff, partner in Barclay's Pipes in Columbus, sent me a 1972 Advertisement from Paul's Pipe Shop in Flint, Michigan. I called Paul Spaniola, proprietor of the shop who, at the age of 86, is still running the store with his son and wife. Paul invited me to see his shop and pipe museum and, when I got a couple of days free, I drove up to visit with him. He still had a number of these pyrolytic graphite pipes in stock and had been marking them up over the years to keep up with inflation. His prices were high, but not outrageous for unsmoked brand new pipes, many in their original boxes, and I bought quite a few. This is one of them. By the way, the Paul's Pipe Museum is worth a trip to Flint. As part of his claimed million pipes in stock (I didn't count, but I don't doubt - he has a lot of pipes. ), he has examples of just about every 20th century pipe maker and many unusual pipes. One item was of particular interest to me; a display board for THE SMOKE that showed all the shapes and colors in which it was offered. He also sold me a couple of what he called &quot;stone pipes.&quot; They have a free-style exterior of some kind of rough finished material with a pyrolytic graphite bowl liner. He said he had no literature or recollection of what the exteriors might be made, but it is surprisingly light weight. An Advertisement I have shows these as part of a series called featherROCK. 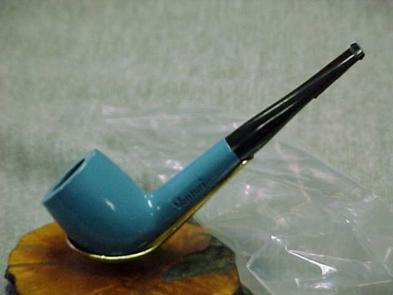 I had this Blue Billiard Venturi pipe for over 2 years before one came along that still had the original price sticker on the mouthpiece. I hated to part with this one, but Allen Wirtz was so happy to get a replacement for the one he had smoked for many years before it disappeared, that I know this one went to a loving home.